Fresh data on economic growth and key quarterly reports from Tesla, GoPro, and 3D Systems are on tap for investors over the next few trading days. Stocks took a step back last week, as the Dow Jones Industrial Average and the S&P 500 each lost 1.3%. That drop wasn't enough to derail an overall rise for the month of April, though, and indexes remain in positive territory. This week, the highlight of the economic calendar might come on Friday when the government releases its monthly employment report. Wall Street expects the economy to have added roughly 200,000 jobs in April, which is on par with the healthy pace we've seen over the last several months. Meanwhile, hundreds of companies are set to post earnings results over the next few trading days, including such stock market heavyweights as Tesla (NASDAQ:TSLA), GoPro (NASDAQ:GPRO), and 3D Systems (NYSE:DDD). Tesla's stock is up 30% in the last three months amid growing excitement that its mass-market electric automobile, the Model 3, could enjoy strong demand when deliveries begin late next year. But the carmaker will have to navigate several critical operating and financial challenges before the first customer can take a Model 3 for a spin. Its Q1 car delivery pace failed to meet management's forecast as part shortages slowed the production ramp-up for the Model X. On Wednesday, investors will be keen to hear if those bottlenecks have been cleared, or if Tesla has many more kinks to work out before it can reach its aggressive delivery pace target. On the financial side, watch for evidence that the company is meeting CEO Elon Musk's goal of achieving positive cash flow, and non-GAAP profitability for the full year. Progress has been made in 2015: Operating cash flow spiked to $180 million in Q4 2015 compared to a $54 million outflow in the first quarter of 2015, and gross margin ticked up to 21%. Production issues could hamper that progress, though . Wall Street is bracing for bad news when GoPro posts Q1 results on Thursday afternoon: Sales are expected to drop by over 50% as the camera device specialist swings to a loss of $0.60 per share from the prior year's $0.24 per share profit. At its last quarterly outing, GoPro's results included a brutal 31% sales decline as profitability dove to 29% of sales from 48% in the year-ago period. Weak demand for the premium-priced Hero 4 device contributed to the slump, as did -- what CEO Nicholas Woodman described as -- a fundamental usability problem with many of its products. "We recognize the need to develop software solutions that make it easier for our customers to offload, access, and edit their GoPro content," he said in a press release . In addition to the software tweaks, GoPro aims to refresh the design of its devices with help from a flashy new executive hire that used to work at consumer tech kingpin Apple. Investors will be looking for signs that new initiatives like these can help spark a rebound in sales and profitability before competitors edge in on GoPro's turf. 3D Systems will post its quarterly results before the market opens on Thursday, and expectations are high. 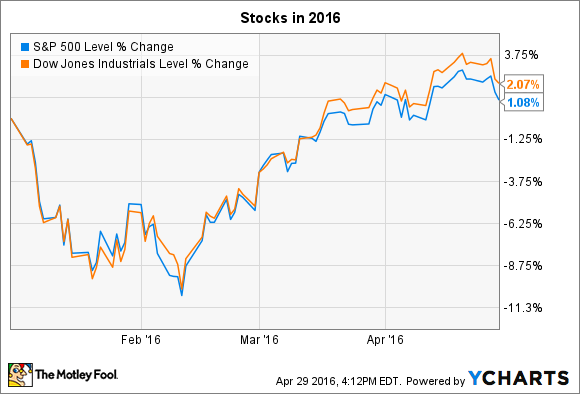 After all, shares have doubled so far in 2016 (but remain down 30% over the last full year). Part of the enthusiasm revolves around new CEO Vyomesh Joshi and what he might bring to the table in terms of experience, operating strategies, and financial plans. Some analysts on Wall Street believe the new appointment could bring cost cuts, and a more focused product plan that will have 3D Systems quickly returning to profitable growth after a disappointing two-year stretch. For their part, company executives think they can navigate the weak demand environment by shifting away from consumer-printing and toward growth categories like industrial and professional sectors. Still, 3D Systems' changing management philosophy is likely to be the key detail investors are looking to learn about this Thursday.